Did your grandparents ever tell you how to predict the weather using different signs in nature? The seeds of the persimmon are believed to give us clues about the weather for the upcoming winter months. 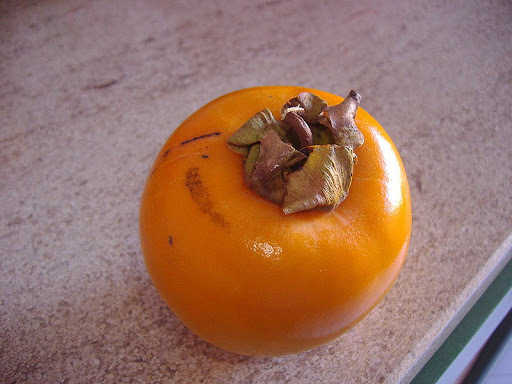 The persimmon is a light yellow-orange to dark red-orange fruit that grows on a tree. The persimmon can be as small as ½ inch to as large as 4 inches in diameter (across). Some persimmons are round in shape, but some look more like an acorn or have a pumpkin-shape. What shape is the persimmon in the picture? 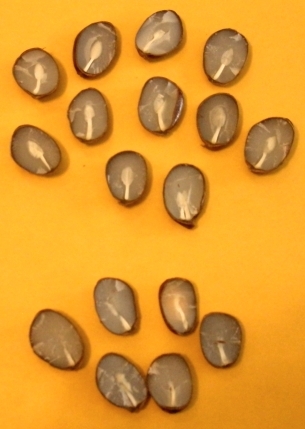 When a persimmon seed is cut open, there will be a shape to the kernel inside the seed. In folklore, the shape of the kernel can be used to predict the winter weather ahead. If the kernel is shaped like a spoon, what do you think it means? A shovel is shaped like a spoon so people thought it meant that the winter would have a lot of heavy, wet snow falling. The winter would be one with a lot of shoveling. If the kernel is shaped like a knife, what do you think it means? A knife cuts through things, so people believed a knife meant a winter with lots of ice and wind. Ice can be sharp, like a knife. When the wind blows very hard, people sometimes say it “cuts through you like a knife”. If the kernel is shaped like a fork, what do you think it means? A fork can be used to pick up light food, like peas. People believed a fork-shaped kernel meant there would be lots of light, powdery snow and a mild winter. Persimmons do not grow everywhere. To use them to predict the weather, it is said they need to be raised near where you live, and the seeds need to be ripe. What do you think about this method of predicting the weather? Make up your own story about using a seed to predict something. What seed will you use? What will you predict with it? 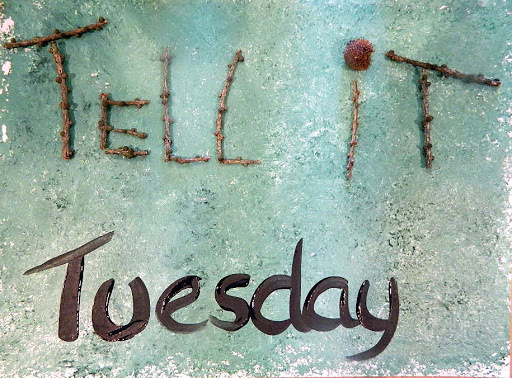 Send me your story if you like. I enjoy reading stories.